Doug Casey told me in January, “The only thing that scares me is that central banks are buying a lot of gold; they’re historically contrary indicators.” When it comes to buying gold, central banks have such a poor timing record that they’re frequently joked about as a contrary indicator. We dislike referring to tonnes of gold instead of ounces. Gold is priced by the ounce. But certain market players, especially central banks, report gold transactions in tonnes. One metric ton (tonne) equals 32,150.7 troy ounces. Net central-bank purchases in 2011 exceeded 455 tonnes. This was only the second increase since 1988 (the first in 2010) and the largest since 1964. Turkey has added over 123 tonnes since last October, buying 29.7 tonnes in April alone. Mexico has purchased over 100 tonnes since February 2011. Russia continues buying, adding 15.5 tonnes in May. Its total reserves now stand at 911.3 tonnes, the highest level since 1993. South Korea has bought 40 tonnes since May 2009, an increase of 180%. 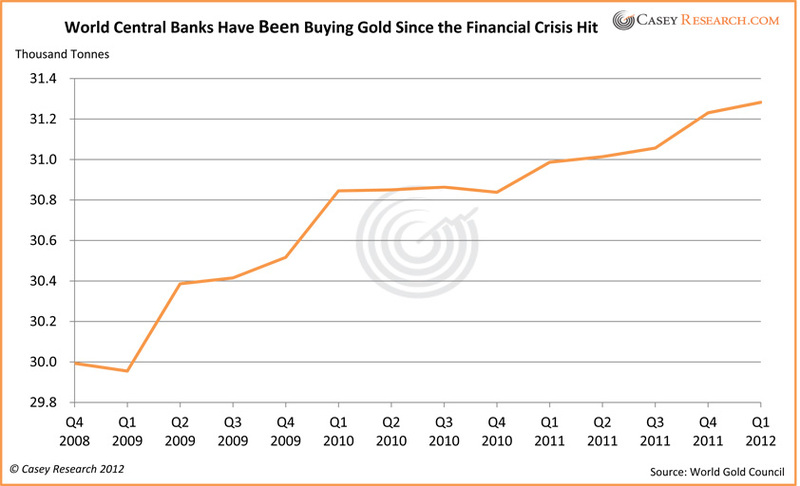 The World Gold Council (WGC) reported that central-bank purchases totaled 80.8 tonnes in Q1 2012, about 7% of global demand. Over the past 12 months, net purchases have averaged almost 20% of total annual supply. Here’s the picture of what has transpired since the financial crisis hit in late 2008. Central banks have added a net of 1,290 tonnes since the fourth quarter of 2008. This total excludes China and other nations that don’t regularly report their activity, as well as countries that have been surreptitiously buying their own production. That’s a lot of gold buying. One has to wonder whether so much buying may in fact signal a top for gold. After all, a number of prominent analysts have claimed for some time that gold is in a bubble and that it’s all downhill from here. Not so fast. Like many mainstream reports, looking at the short-term picture usually leads to erroneous conclusions. Let’s put central-bank purchases into historical perspective. 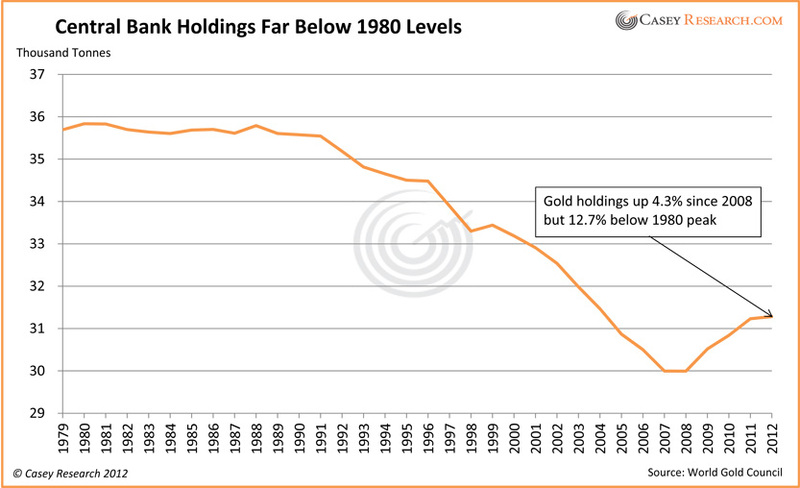 In spite of the recent activity, world central-bank holdings are far below what they were in 1980. Clearly, a few years of net buying does not a bubble make. Foreign-exchange holdings have increased 650% since 1995, and now total $10.4 trillion. It seems rather obvious that a lot more “catch-up” buying is needed before we start talking about a top for gold on this basis. Meanwhile, we think the trend of central-bank gold buying will continue. It’s not hard to see why: central bankers around the world know what it must ultimately mean to run the printing presses the way the US has since 2008, even if price inflation is not immediately obvious. It’s no surprise that they want to hedge their bets, moving more reserves into something with actual value… something that can’t be debased with a few keystrokes. The US dollar has been the world’s reserve currency since WWII, and that’s beginning to change – the movement into gold is just one facet of that change. The entire world may indeed be beginning to understand that it’s operating on a fiat currency system backed by nothing. At the same time, the sovereign debt crisis in the Eurozone is intensifying, and some countries have succeeded in inflating their currencies faster than the Fed has inflated the USD. It doesn’t take Nostradamus to read this writing on the wall… and while the world’s central bankers can lie to the public, they themselves know how bad things are. In fact, the WGC is so confident that central banks will continue to buy gold that it’s changed its reporting structure: it’s added “official sector purchases” as a new element of gold demand, while eliminating “official sector sales” as a negative supply factor. Of course, gold will someday top, and Doug Casey believes a bubble in gold and related equities is highly likely at some point, courtesy of the trillions more currency units governments will create in a desperate (and ultimately unsuccessful) attempt to stave off the Greater Depression. But we’re nowhere near that point. There’s a long way to go before we start legitimately using the “B word” (bubble) or “S word” (sell). In the meantime, I suggest using the “B word” (buy) or “A word” (accumulate) to make your decisions about gold.